Getting ready to remodel or add a bathroom, Homeowners’ #2 and #3 requests are for more (and better) storage, and an up-to-date look. 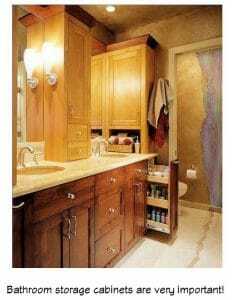 Bathroom cabinets can satisfy both needs! The #1 request is for a large(r) shower. Back-up stock of tissue, hair care products, soap, and lotions (Costco overflow). Two pull-out base pantries, normally used in kitchens. An electrical outlet was installed in back of each pantry, so blow dryers for each person could be immediately available for use, yet easily stored. Adjustable shelves on the pantries made room for everyday personal-care products. Lavatory cabinets with tilt-out trays for nail clippers and other small tools that can get lost in drawers. Electrical outlets were installed behind these cabinets, for rechargeable care products. A bank of three drawers with two deep drawers for towels. Three tall wall cabinets for personal-care products and backup storage. In the adjacent room, a shallow wall cabinet was placed over the toilet, for tissue storage and towels. Because the Homeowners had decided to abandon a small existing shower in the toilet room during the design phase of their project, the area was available to convert to a generous linen closet, not only for towels, but bed linens and pillows. The new closet became an important feature, because it allowed us to install an accessible transformer that powered low-voltage lights that enhanced a display niche in their shower! Satin nickel plumbing fixtures, light fixtures, and hardware. Plumbing should be selected first, then bathroom cabinets should be defined. Because bathrooms are often small, storage is a critical issue. Kitchen-height cabinets are preferred for two major reasons: (1) They are ergonomically better, requiring less bending that causes backaches; (2) The difference of 4″ to 6″ will allow more and better storage. See before and after photos plus a description of the featured project. Read about Diane Plesset’s philosophy, experience, and training. © Copyright 2016 D. P. Design – All Rights Reserved. The Northwest is so BLESSED to have DP Design in such close Proximity. Diane Plesset you are, INDEED, A RARE JEWEL. and a BLESSING to your community. I cannot tell you how much I miss your smile and your treasure trove of design ideals that have not only been a blessing to me but to hundreds of wonderful families in the Great Northwest. Harvey, you are so kind! I miss seeing you, and talking with you since you moved to Florida. We had a lot of fun, being co-hosts with Kenny Fritzler on KPDQ-FM every Saturday morning for over three years. Oregon just isn’t the same without you!